JFreeChart is “open source” or, more specifically, free software. It is distributed under the terms of theGNU Lesser General Public Licence (LGPL), which permits use in proprietary applications. For a closer look at JFreeChart, please try our JFreeChart Demo (web start) or browse the Samples page. This page contains examples of the charts that can be produced using JFreeChart. If you’d prefer to see a live demo, please try our JFreeChart Demo (web start). The JFreeChart project was founded seven years ago, in February 2000, by David Gilbert. Today, JFreeChart is used by approximately 40,000 to 50,000 developers (see a list of some of the products and projects that use JFreeChart). The project continues to be managed by Mr Gilbert, with contributions from a diverse community of developers. If you are interested in joining the project, please see the Developers page. 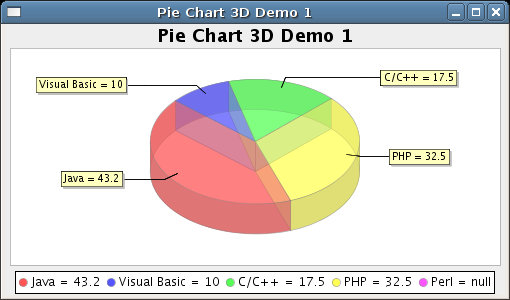 JFreeChart requires the Java 2 platform (JDK version 1.3 or later). Note that JFreeChart is a class library for use by developers, not an end user application. JFreeChart requires the JCommon class library. The JCommon runtime jar file is included in the JFreeChart download — if you require the source code for JCommon (recommended), you need to download this separately. Funding for the project is provided by Object Refinery Limited, David Gilbert’s private limited liability company based in the United Kingdom. Object Refinery sells documentation and consulting services related to JFreeChart.